Ventilation holes in all doors. Sloping tops, plinths and seating benches available. Doors are left as standard, but can be right hinged. Fully lockable with three locking systems available; cam locks, latch locks and flush locks. 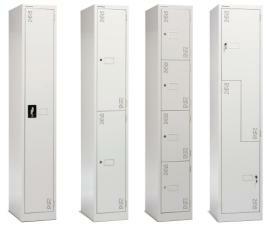 Three point locking with flush lock is fitted as standard on single tier lockers. Powdercoated in a range of scratch resistant colours.